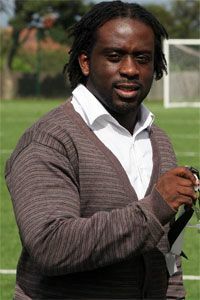 Olivier Bernard recently bought Durham City Football Club and the former Newcastle left back has a long term ambition that Durham City be a feeder club for Newcastle. that they can become a feeder club for Newcastle United. Durham currently play in the Northern League and Olivier’s intentions are to get them into the football league, much like Gateshead FC have done recently. The aim is to promote local football at the grassroots level in the north-east, and this could be helpful to Newcastle, and other surround local pro clubs who want to bring in local players to their clubs. We lost Alan Shearer to the Southampton Youth Academy and then had to pay a then world record fee of £15M to get him to Newcastle in the summer of 1996, so Olivier is keen to help find and groom local players. Durham is now looking at ways to promote the club from both local and International companies and businessmen. Durham is a club ran solely by volunteers and need sponsorship to help with the running costs of the club, and Olivier can then begin the work of making Durham City into a much improved side over the next few seasons, and eventually into a feeder club for professional teams, including Newcastle United. And if you know of any individuals or companies who would be interested in sponsoring Durham City, please send this article to them. good article Ed, really nice to see people doing things off their own back to help the club, really hope this works out for Bernard. good ol bernard hope we can give him a few youngsters to help him get promoted ! sounds like he knows the coaching aint good enough when younger and plans to give us a boost in his own way. I think this is a great project and we’ll be supporting Olivier and crew – as they pursue this worthwhile project – it’s much needed in the region. Anything that promotes the region in a positive way should be applauded. exactly…at the very least it gives the region another club wit the support of a former profrssional….his experience can only benefit the kids/senior players at that club. Mbiwa is our highest paid player. …… In terms of player, I really think Remy, like Cisse would benefit from a player alongside him. It certainly seems to help him scoring when playing alongside even Shola. I feel with that said we need to, and probably the only thing we need to do is buy a player in the mold of Carroll/Shola. We really should then focus on securing Remy in the meantime or his replacement, someone who will add pace. Unfortunately I feel Aubameyang was the first choice this season, and we failed to secure him. My personal opinion, and option would be to go for John Guidetti from Man City. Take a chance! Short Term target, one we can use a back up Shane Long. Has pace, knows where the goal is and more importantly gives 100%. Hopefully this’ll work out, our youth development has been poor for a while now. Having more eyes at grassroots level can’t hurt although i still think our academy needs a lot of work doing to it, there is talented kids out there we just don’t seem to find them. A rare post from Ed himself – only about the third time I’ve seen that! Know somebody who works at Durham FC, he reckons the actual money man isn’t Bernard but they’ve brought him because the club know it will generate good publicity. I love this, I think all of us would love a go at something similar. Im a huge Football manager fan so maybe thats why it appeals to me so much. I think with his connections he should be able to transform them into a decent small club in the next 5-10 years. Would be great to have another team to take the regions youth players on loan too and provide competitive football. Im sure the club could also happily offer squad places to youth players not getting kept on by the bigger clubs in the region too. A bit like the glenn hoddle academies. Great for the region and a really good article Ed!! I see we are being linked with Carlton Cole who is on a free transfer, what are the chances we end up with him? It is great to see an ex-pro not only passionate about the Toon, but passionate about the North East as a whole. Durham is 1 of only 4 counties in England without a league club, and I wish Bernard every success in trying to get Durham into the league. Would love to see the Heed get promoted from the Conference too. Top – top man—– how about buing nufc mate ? I’ve never had a problem with this site on my mobile, but it slows up my pc to almost a standstill. No, we need to buy a player in the mould of Negredo!! Iv mentioned this already but what does everyone think of Mame Biram Diouf? Hes out of contract this summer. Id rather him than gomis. ED, if you want to improve this site 10 fold then write a quick little article about downloading ‘AdBlock Plus’ it will completely remove all of the bogus adverts on the site. I’ve told people numerous times this will sort all of their problems advert wise. You’ll have it downloaded and working in 1-2mins tops. If your not great with computers ask a son / daughter to do it for you or follow this tutorial 🙂 – http://www.youtube.com/watch?v=6i2-jzl1W7k or one similar. Negredo – 1.86 meters and 87 kg of solid power with a burst of speed. de Jong – 1.88m and 86kg? Doesn’t Durham have an international renounced university? sweendog, never used it on a mobile before to be honest so I wouldn’t no! However Firefox is the superior browser in my opinion, I have used it for a long time now. Jesper, decent university I think, they have one of the best uni Rugby teams in the country. I use FF on me tablet if I use chrome I am redirected all over the shop ad blockers or no. Mind android is horrible for giving sites all the info they need about you. Being logged into Google and all. 🙁 That’s why I have a BlackBerry Z10 Doesn’t tell the world and it’s dog what colour crackers you have on. On Ollie, my abiding memory of him was bring cobbled by Gravesen when Everton undeservedly beat us 1-0. He wasn’t the same after that for me. Durham FC ground is next to soccarena in dragon ville where I used to play footy. I think they had a problem because of their 3g pitch, they had a decent team but weren’t allowed promotion because of the astroturf, so all the decent players jumped ship. Dont know how they’ve got round that lately anyone know? I think your source at Durham should stop speculating as Olivier has bought the club and is putting his own money into it. And trust me, out of all the people on here, I am the person who should know as I am the person who contacted Ed to see whether he would do this article. Thank you Ed by the way. Your support is much appreciated on this. Tsunki, you are correct. The pitch is the reason why promotion had not happened. Now, it is not so much of an issue as the club isn’t close to that kind of promotion at the moment. Tinman…I have always been told that the University of Durham was the leading alternative to Oxford and Cambridge? Durham is big on Oriental subjects I believe, has had links with the far east for some years now. Well regarded uni. It’s not a very big place Jesper, probably the smallest city I know. …maybe the university is big?